So all May we were supposed to pay "Ode to Summer!" But Cincinnati was far from being summery! It rained. A lot, actually. It was dark and gloomy. And it was COLD! We still have our light jackets handy. Thankfully, the last couple of days, the weather Gods have smiled. Mornings are still little cold, but as the day progresses, it is getting warmer. Afternoons are particularly warm. So when I greeted Sid with a glass of chilled Watermelon Agua Fresca, when he came back from school today, his smile said it all! 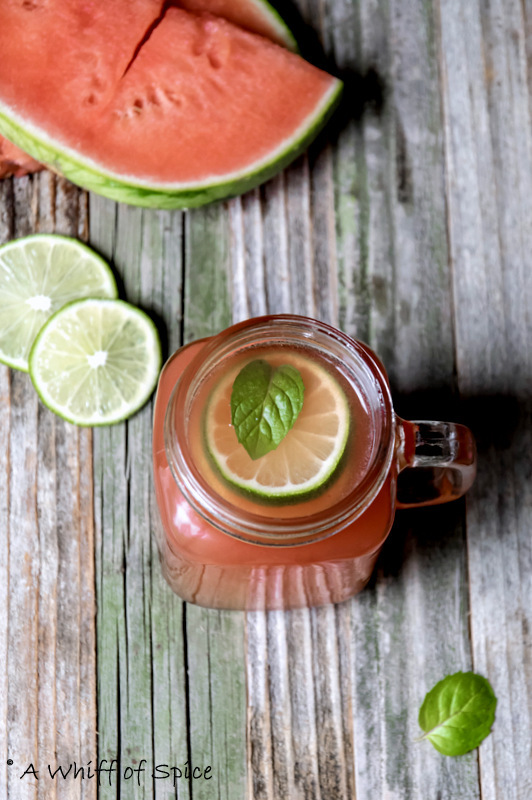 Agua Fresca, which literally means 'fresh water' in Spanish, is a very popular summer drink sold by streets vendors in Mexico, Central America and the Caribbean. They are also abundantly available in the Unites States too, but at restaurants! Agua Fresca, is just a simple mix of pureed fruit and water with just a subtle hint of sweetness. Almost like 'fruit infused' water. They are highly hydrating and thoroughly refreshing and perfect for the hot and sultry summer months! This 'fruit infused' water is a snap to make. The key is to strain the pulpy fruit to make a clearer liquid. Simply puree the watermelon and pour through a fine sieve or cheesecloth. 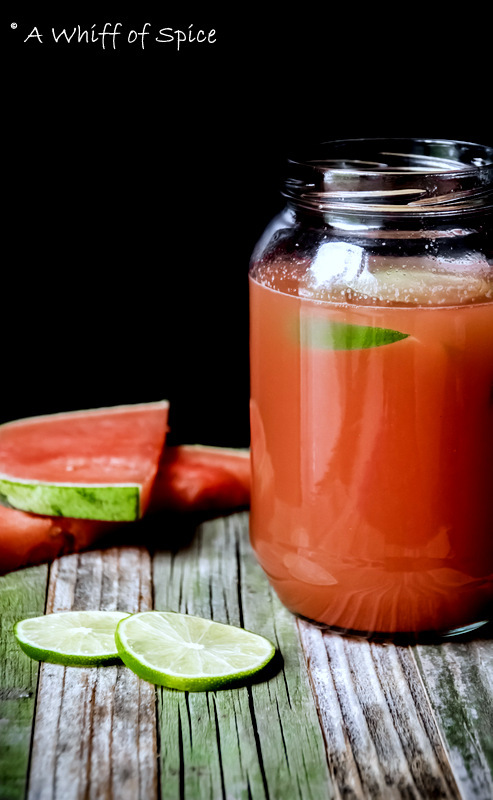 In a pitcher or a punch bowl, mix strained fruit puree with water and sweeten with just a hint of Agave (or Maple Syrup or Honey) and jazz it up with a splash lime juice and done. Really! That simple! For my Agua Fresca, I went with Watermelons this time. Sid love watermelons and threw a mini tantrum at the grocery store to buy one. Any other melons like cantaloupe or honeydew are excellent choices too. Or you could do a berry blend, or pineapples, or even mangoes. Basically, any fruit that is soft enough to puree with water, is a good choice for Agua Fresca. I actually have a Strawberry-Pineapple Agua Fresca recipe, which is a super hit beverage at out summer barbecue party. So what are you'll waiting for. Whip a batch with your favorite fruit! 1. Combine the chopped watermelon and 1 cup of water in a blender and blend into a smooth puree. 2. Pour the mixture through a small mesh strainer or cheese cloth, (I prefer the cheese cloth) into a large bowl or pitcher. Discard any stray seeds or pulp caught on the cheesecloth/strainer. 3. Add your lime/lemon juice and the rest of the water (3 cups) to the bowl or pitcher and mix well. 4. Add a pinch of salt. It helps to bring out the flavor of the fruit. 5. Add the sweetener of choice and mix well. I used Agave Nectar. Honey, Maple Syrup, regular sugar, simple syrup or even sugar substitute can also be used. The amount of sweetener will also depend on the sweetness of the fruit. I started with 1 tablespoon of agave and increased by 2 tsp till I reached my desired sweetness. I ended up using a little more than 2 tablespoon of agave nectar. 6. Chill it in the fridge for at least two to four hours before serving. 7. Serve over ice and garnish with mint leaves (optional). Notes/Tip: Seltzer or sparkling water or flavored water can be added instead of regular water for a interesting twist. Personally I do not like filtering the pulp from the juice. But for Agua Fresca, its worth making that extra step of straining (double straining for clearer liquid) the pulp from the liquid. It makes the juice more potent, flavor wise. Watermelon is an excellent fruit that effectively hydrates, detoxifies, and cleanses the entire body on a cellular level. It is rich in vitamins A and C as well as lycopene, beta-carotene, lutein, and zeaxanthin which are excellent for providing protection from lung, mouth, pancreatic, breast, prostate, endometrial, and colon cancer. Watermelon is also known to significantly reduce inflammation, help flush out edema, aid in weight loss, and alleviate depression. Watermelon can also boost the immune system as well as strengthen vision. Watermelon is not nearly as high in sugar as most people think as it has half the sugar than an apple. Watermelon is loaded with antioxidants that have the ability to neutralize free radical molecules and aid in the prevention of chronic illnesses. 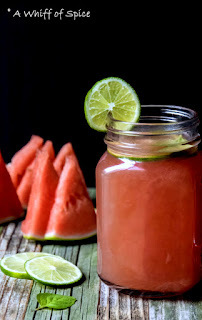 The rind of the watermelon is equally beneficial as it is one of the highest organic sodium foods in nature and one of the best sources of chlorophyll and can be juiced for a delicious and healing drink.